The best Way to your Web-Application GUI ! Welcome to the ReinHTML Dialog Designer ! What is the ReinHTML Dialog Designer not ? The ReinHTML Dialog Designer is no PC-based tool to develop home pages. It concentrates on design of functional HTML forms and does not claim to be a universal tool for general web design tu utilize all graphical features of HTML. Graphical designers do not belong to the target audience of the ReinHTML Dialog Designer. What does the ReinHTML Dialog Designer cost? Currently the usage of the ReinHTML Dialog Designer is free. If you want to store and download dialog layouts, you need a free user account. I ask for your understanding that the number of user registrations is limited . This limitation will be removed after the introduction phase. For non commercial use and for evaluation purposes free accounts still will be available. Commercial usage variants will be available for a fee. Features - What does the ReinHTML Dialog Designer provide ? You can enhance and modify generated dialogs also manually without the ReinHTML Dialog Designer. HTML elements are wrapped in a library of user interface controls. There is no need to know (much) about HTML to utilize the tool. 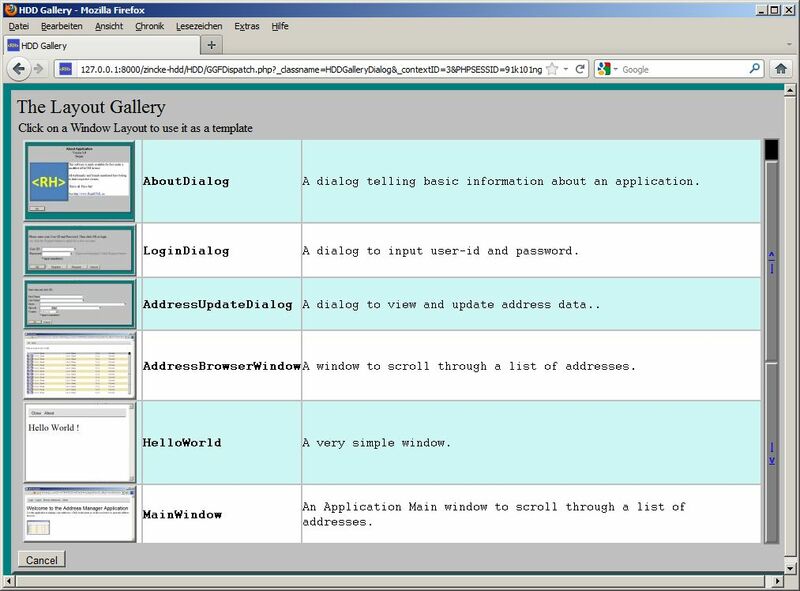 The ReinHTML Dialog Designer generates a HTML file that implements a dialog form and triggers CGI scripts (for instance in Perl) that process input data and react on user interactions. For instance you can specify for each button, which script should be called when the button is pressed (callback function). But from the same source you can also generate PHP. Generation of server side PHP code that fills dialogs with data and reads and checks form input data. For each window or dialog a class is generated, that generates all necessary HTML elements generiert and contains event-handler functions that implement the functionality behind active user interface controls(Buttons, Menus, Hyperlinks). Enhanced properties – mandatory, readonly, named controls, callback functions for buttons and menus, context sensitive help, server-side input checking.... See www.ReinHTML.eu/ggf. Via the link "Architecture" you will find a detailed description there, how to assembla the generated files to an application. Here are some samples how to work with the tool. You do not need to install anything to use the ReinHTML Dialog Designer. 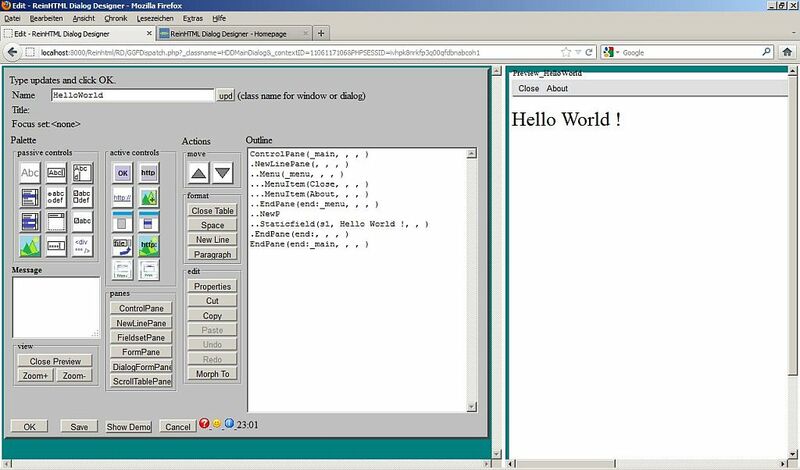 You can access the tool online ( ReinHTML Dialog Designer). 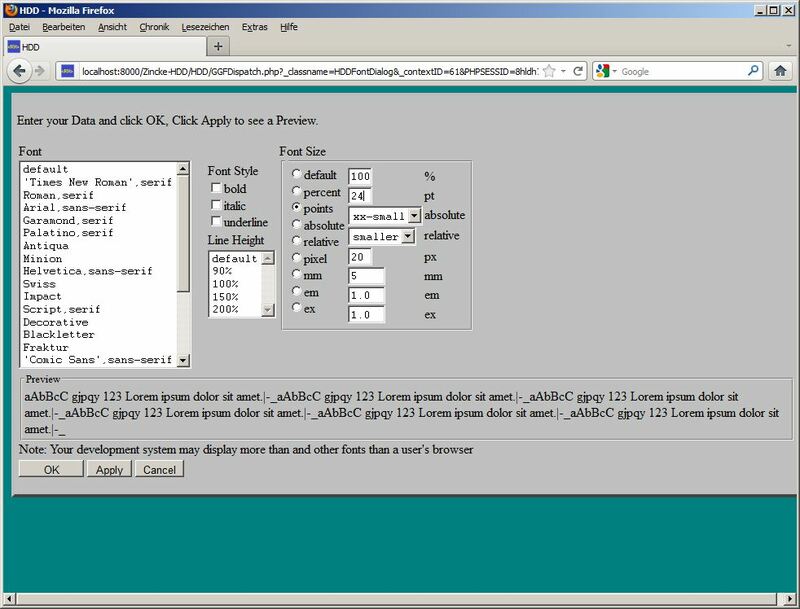 With the ReinHTML Dialog Designer you can download your layouts as HTML files or PHP classes. If you choose HTML, you need to download a CSS file to display the generated HTML files properly. You can can find it at the main window . However you also need to write some scripts to implement the functionality behind your HTML files. You can do this in any script language, for instance in Perl. The ReinHTML Dialog Designer allows you to specify for any active user interface element (for instance a Pushbutton), which script should run when the button is pressed. For larger web applications I recommend using PHP. You need an application framework, the GGF Framework to execute the generated PHP classes. Please refer to the GGF Framework Site for more information how to download the framework. I recommend following the link "Architecture" and reading how the framework works, how you can download and setup an execution environment either on your own PC or on a web server in the Internet. I am looking forward to your feedback, constructive critcism, improvement proposals, bug reports... please send a mail to office11@ReinHTML.eu. Send me your coolest layouts to publish it in the Gallery ! Think about a Donation ! You can do this easily and secure via PayPal (even if you don't have an account there).